Sherry FitzGerald O'Meara bring this large parcel of land located just to the west of Athlone town to the market. Measuring approximately 67 acres in total, the lands are divided by the N61 Athlone/Roscommon Road. The lands are located in Monksland, one of Athlone’s most progressive districts, with a number of high profile commercial and residential developments having taken place in recent years. 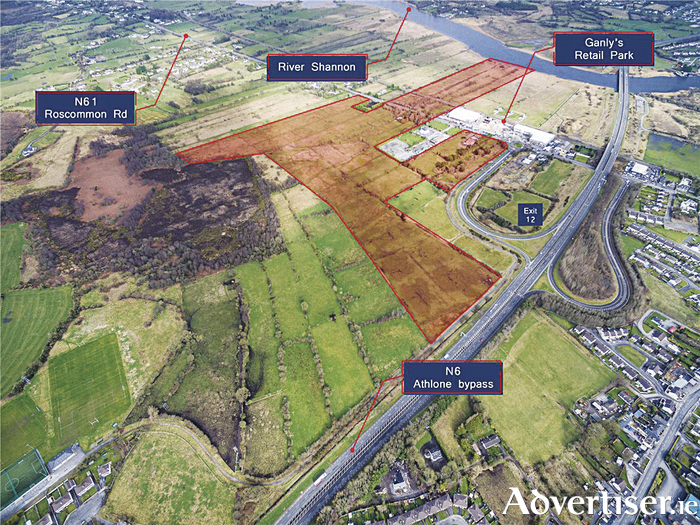 The lands are situated approximately 2km west of Athlone town centre via the R446 Galway Road, which provides access to the M6 Dublin to Galway motorway. Athlone Institute of Technology is situated approximately 8km from the subject lands. Athlone, with a population of around 20,000 people, is located centrally within Ireland and is the administrative capital for County Westmeath. Dublin is located 124km east and Galway 86km west of the town. Ireland’s largest electrical retailer, Ganly’s, is located opposite the subject lands and includes tenants such as Expert, Stanley, Aga, Halo Tiles and others. Large local employers in the area include Alkermes, Ericsson, and Covidien. The Irish Army, IDA, Revenue Commissioners, ESB, CIE, and An Post also provide employment in the locality. The area is well served by both public and private transport links, with Athlone train station located less than 3km from the subject site. Bus routes provide links to Dublin, Galway, Cork, Mayo, and other provincial locations, while the train service provides a link to Dublin city centre. Major roadways serving Athlone include the M6 Dublin to Galway road and the M55 linking the town to Mullingar.